Simdega district in Jharkhand, with a large tribal population, and chronically beset by high levels of malnutrition and ill health, has shot into the national news recently for all the wrong reasons. The tragic death of a 11 year old girl named Santoshi Kumari has stirred public conscience, at a time when the lives of poor people appear to have fallen off the Government radar almost completely. Simdega district in Jharkhand, with a large tribal population, and chronically beset by high levels of malnutrition and ill health, has shot into the national news recently for all the wrong reasons. The tragic death of a 11 year old girl named Santoshi Kumari has stirred public conscience, at a time when the lives of poor people appear to have fallen off the Government radar almost completely. The video recordings which went viral after the incident capture the plight of a family so poor that they could not feed their 11 year old child. She literally starved to death, pleading with her mother, Koyli Devi, for some rice. The outpourings of the other family members- no less hungry and deprived- are a testimony to the distress situation in which the poorest families in our nation eke out their lives. It is also a pointer to the drastic weaknesses that prevail in the Public Distribution System- which have got aggravated by the introduction of the aadhar card and biometric linkages in the food security programme. Of course, the BJP Government in Jharkhand went into damage control mode immediately, the Chief Minister, Raghubir Das promptly set up an enquiry committee which established that the death was due to malaria, ( as if that is any excuse) and the State Food Minister, Shri Saryu Rai, claimed that the Aadhar card had not been made mandatory to collect foodgrains from the PDS in the state. Additionally, the administration asserted that the family did have a 12 digit UID number, so there was no question of denial, in any case! Where lies the truth? Noted economist, Jean Dreze, who has been predicting deficiencies in the PDS if it gets linked to Aadhar for some years now, wrote with indignation about the incident: Koyli Devi, who lives in dire poverty, had not received any rice from the public distribution system for several months before her daughter’s death. As Jharkhand’s food minister Saryu Rai candidly admitted, the family’s ration card had been cancelled on July 22, 2017. Their food rations, however, had been discontinued much before that. 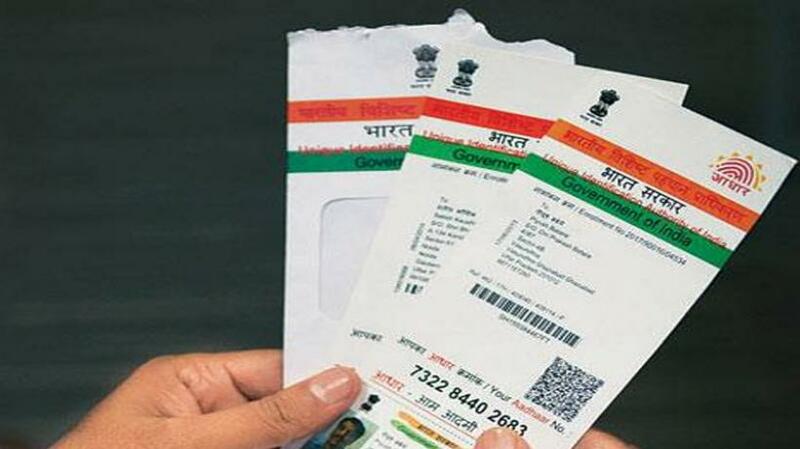 The reason, in both cases, is that the family’s ration card had not been “seeded”, or electronically linked, with any Aadhaar number – the 12-digit identification number that the Indian government wants every resident to have. In other words, this family could not avail of the ration quota which was their right, and which could have prevented the death of a girl due to starvation, because of the aadhar linkage policy. In fact, according to one report, the Chief Secretary of the state, (who executes the Government’s policy directives), had issued orders that the PDS supplies must not be given to those who had not linked their aadhar number to the ration card. The shopkeepers were only carrying out this directive diligently. In total contradiction of the claims that have been made in the media, the Aadhar based biometric authentication is now compulsory in nearly 80% of the ration shops in the state. Not surprisingly, a significant section of people in Jharkhand have been victims of denial of their food entitlements during the last few months. The system now requires that at least one member of the family should have Aadhaar number correctly seeded into the system, which is not a trivial matter by any means. Consider also that in a place with very poor infrastructure and facilities, the bio metric authentication also requires internet connectivity, a working point of sales machine, and successful fingerprint recognition. Thus, despite various safeguards, such as the “one-time password” option, whereby those who are unable to authenticate themselves using fingerprints can get a password on their mobile phones, the system often fails. Activists working in Ranchi district – which is the capital of the state- have noted the trends since Aadhaar-based biometric authentication was made compulsory in ration shops after August 2016. When it was introduced, rice distribution levels declined sharply, but the government ignored the warnings, and pressed on with imposing biometric authentication in other districts. It took about four months for the system to stabilise in Ranchi district. From January onwards, according to a careful analysis of official records by a research student at Jawaharlal Nehru University, the proportion of cardholders who were unable to buy their food rations hovered around 20% month after month. Assuming similar failure rates elsewhere, this suggests that about one million families in Jharkhand are deprived of their food rations each month. In a random sample of 18 villages where biometric authentication is compulsory, the exclusion rate, defined as the proportion of cardholders unable to buy their food rations in the previous month, was 37% according to official records, and 36% according to the household survey. The survey also brings out that the victims of exclusion tend to come from the most vulnerable groups – for instance, widows living alone or elderly couples. In areas that are still “offline”, where biometric authentication is yet to be introduced, the exclusion rate was only 14%. Despite all the evidence presented from the ground through social audits, the various articles and media coverage of the dismal situation with regard to food deprivation, etc, the State Government as well as the Central Government is still in a denial mode. As one senior food ministry official in New Delhi put it, Aadhaar-based biometric authentication is “the government’s policy”, full stop. The pressure comes straight from the Prime Minister’s Office and applies down the line. Characteristically, the Jharkhand government made a show of taking action against small-fry officials who were supposedly responsible for Santoshi’s death. For instance, the auxiliary nurse midwife of the area was suspended for failing to alert the government to the fact that Santoshi had malaria – the government claims Santoshi died of the disease, but the family denies this forcefully. Meanwhile, the real culprits in the case – the senior decision-makers in Ranchi who made biometric authentication compulsory for the public distribution system in violation of Supreme Court orders – continue to escape scrutiny. The Unique Identification Authority of India, for its part, claims to have absolved Aadhaar of any responsibility in this matter by pointing out that some members of Santoshi’s family have an Aadhaar card. But that is not the issue at all. The problem is failed or faulty Aadhaar seeding, followed by the cancellation of the ration card. Lack of Aadhaar is only one possible hurdle involved in biometric authentication, but there are many others. The hypocrisy that underlies the behaviour of Government officials who are falling over each other to express surprise or indignation at the Simdega incident is reprehensible. Surely, they know that the public distribution system is a lifeline for the rural poor in Jharkhand, that biometric authentication is now compulsory in most ration shops, and that it has high failure rates. Intensified hunger is the logical outcome of this policy. The Jharkhand government, instead of learning from its mistakes, made the situation worse last March by ordering mass cancellation of ration cards not linked with Aadhaar. Sure enough, the cancelled cards were declared “bogus”, and the whole operation was projected as another trophy for Aadhaar-related savings. As usual, however, the government is unable to present any evidence that most of the cancelled cards were bogus. Nor is it disclosing the list of cancelled cards for public scrutiny. Koyli Devi’s ration card was only one of them. And the tragic story of Santoshi will continue to repeat itself – unless the policy direction is arrested. Placing Food Security at risk nationally. Unfortunately, the policy is being moved in the opposite direction with unseemly haste. The larger danger of what is happening in Jharkhand comes from the fact that the intent is not confined to this state alone. It is a portent of things to come in other states as well. This is because the Modi Government is hell bent on extending the same model across the rest of the country as soon as possible. Jharkhand is only a trailer towards this end. It is a trailer filled with the misery and suffering of the poorest, most marginalized sections of society. For instance, when the PDS was integrated with Aadhar number in Andhra Pradesh, the AP Food and Civil Supplies Corporation found that nearly one-fifth ration card holders did not buy their ration. Further, when the government delved deeper in the issue, it was found that out of the 790 cases interviewed, 400 reported exclusion. Out of the excluded cases, 290 were due to fingerprint mismatch and 93 were because of Aadhaar card mismatch! The reports from Puducherry, where the first pilot project was launched, have also revealed exclusion and denial to many of those who are eligible. Hence it is time to arrest the attempts of the BJP Government to undercut and dismantle the protective PDS system, in the name of better governance through aadhar linkage. There are other, equally serious concerns that have been raised with regard to the aadhar project, which merit serious attention. For instance, the creation of a centralized, and interlinked bio metric data base might well lead to profiling and censorship that could endanger our freedom and citizen liberties. Personal data that is collected under the aadhar programme is susceptible to surveillance by the Government agencies. Privacy issues may easily be trampled. The possibility of identity theft, risks of impersonation, banking frauds, etc, are no longer only in the realm of science fiction or hollywood movies- they have moved closer home. Central data bases can be hacked, the biometrics can be cloned, copied, even remodelled. In fact, anticipating the incipient dangers, the UK dismantled its biometric ID data base in 2010. The Government of India would do well to heed the concerns expressed by various experts on this issue. The debate on UID has tended to begin with the premise that Aadhaar is necessary for ‘good governance’. Those claims of the UIDAI have long been demolished. Action research from the ground has shown that Aadhaar cannot help identify the poor, its possession does not guarantee inclusion into government social welfare programmes. The latest Jharkhand tragedy shows how, in fact, the opposite is happening. It provides a wake up call to action. In fact, the dangers and threats far outweigh the claims that are being made. If the Government refuses to wake up on its own and take the necessary steps to arrest this trend, it is the task of movements like ours to blow the conch, and rouse the people!